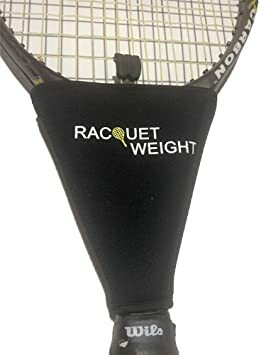 I recently received a demo product from Racquet Weight that I am excited to share with you. Racquet Weight is a simple idea that allows you to add weight to your racquet swing for warm up. The additional weight creates more resistance to your swing and helps to build an increased power and flexibility in your game. Warming up is always important and many of us recreational to club tennis players do very little to prepare our arm, shoulder, and elbow for the challenge of such a physical game like tennis. Racquet Weight uses a unique neoprene material that is weighted and attaches easily and quickly to the throat of the racquet giving you a more balanced and natural feel to your warm up. It can fit any make, size and brand of racquet because of its easy wrap around Velcro design. Inside each Racquet Weight product is weighted “soft iron” that is well protected and covered by the soft neoprene case. In my personal use, I found Racquet Weight to be a perfect warm up tool. It takes literally second to wrap your racquet and seconds to unwrap as well. It does not modify or damage your racquet in any way and even looks nice. It’s small and easy to carry around in your tennis bag, and is a great reminder that warm up is necessary. There are two sizes of Racquet Weights available. The black heavy version or the yellow light version. I tested both versions and did not find a dramatic difference in the heavy verses light except that they were simply heavier or lighter which is as it should be. You don’t want to overly exert your warm up and possibly injure yourself using weight and I don’t find either versions unusable or dangerous depending on your arm muscle strength. I would suggest the heavier version for high School, college, or advanced club to pro players who need a more intense warm up and want to work on increasing their swing speed while the lighter version would be perfect for intermediate and even beginner players who want to slowly increase their power and swing speed while at the same time increasing their flexibility and strength. You can’t go wrong with the light version no matter what level you are. I found a couple of added benefits to using the Racquet weight. Having the weight on the racquet naturally creates more mass that in turn creates more follow through. Practicing every day with this weight attached seems to help me focus more on the complete motion of a swing rather than an abbreviated block I might play under pressure of a game. The repetition of a complete swing empowers you to have a complete swing in your matches as well. Second, I was able to practice my tennis game even on rainy days or days when I was in recovery mode but still wanted to get a tennis workout for 30 minutes. Just be careful to give yourself enough room otherwise you might backhand a lamp! The instructions that come with the Racquet Weight ( which are listed on the website) shows stretching exercises with the weight helps to create a deeper stretch and improve the strength of your shoulders, triceps, and abs. Visit www. http://racquetweight.com/pages/stretch for a detailed guide on how this is recommended. I could not agree more with Khash. I love this product and think for the very low price it is offered, every tennis player should be warming up more with it and have it in their tennis bag.